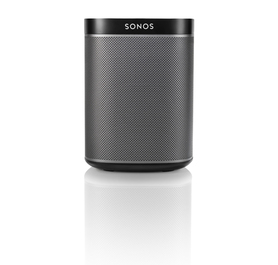 Start your multiroom journey with two, Sonos PLAY1 wireless multiroom speakers. Place in different rooms to enjoy the stereo sound of one playlist or two different playlists. You can even just activate the one speaker if it suits. Sonos PLAY1 is the latest addition to the Sonos wireless speaker family. It brings the same high-end sound quality and ease of use to a more compact form, while staying just as simple to set up. PLAY1 can stream all your music in any room for wall-to-wall sound. It also integrates in moments with your pre-existing Sonos setup, expanding your listening with more detail. You can even control your Sonos from your Android, iPhone or iPad device with a simple App download. The PLAY1 features two expertly-tuned Class D amplifiers, a 3.5-inch mid-woofer and a single tweeter. Combined, these create exceptionally accurate playback across all genres of music. Place this speaker anywhere in your house thanks to its compact size, mounting hole and custom power cord. The continuous curve grille also supports wider sound projection, delivering more flexibility of placement. You can take control of your PLAY1 using your Smartphone or tablet but if neither is nearby there are buttons on top of the device. Just press Pause/Play once to start or stop the music and twice to skip tracks. 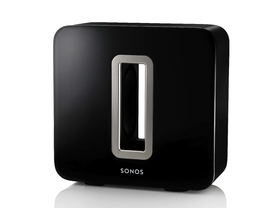 Turn your Sonos speaker set up into a multiroom experience. Two PLAY:1s make a stereo pair which create a bigger, wider, deeper sound. Add a PLAY3, PLAY:5 and PLAYBAR and you’ve created a home theatre. This speaker comes with a standard quarter-inch, 20 threaded insert to readily connect with most wall-mounting brackets.